Looking through photos I’ve taken recently I can’t believe I didn’t post anything about the pro-celebrity football that Wandsworth hosted at Battersea Park as part of Fostering Fortnight. 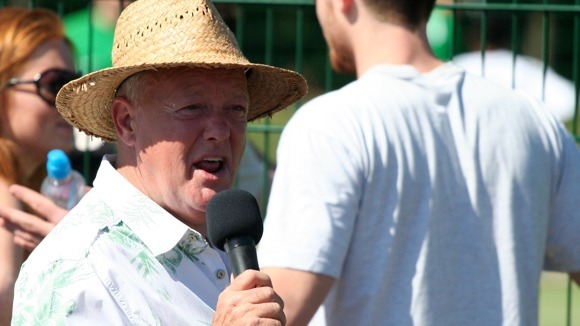 While I can’t say I knew any of the people playing football, I did recognise Keith Chegwin, who was offering a rather unique style of commentary on the event. One perk of being a councillor is the occasional opportunity to see cult-figures in action. Even if only briefly before being dragged around the Millennium Arena track by a MiniMe who was wearing his explorer hat. I’m the recruitment and marketing manager at Wandsworth responsible for this event – which was probably the most high profile event we staged, attended not only by Cheggers, but also Phil Spencer (Location, Location) and Mark Bright (ex-Crystal Palace striker). It was a scorching hot and really successful day which resulted in a significant spike in interest from local people interested in fostering. We’re now planning our event for 2011… watch this space!